2016 was such a busy year for James, as he directed four episodes of Arrow (Code of Silence filming split filming before and after the Christmas/New Year break). Importantly, James was entrusted to direct both the Season 5 premiere and 100th episode, a favourite with both tv critics and fans. I’d like to thank everyone who paid the fan site a visit over the year and/or subscribed and to James. I love whenever he reads and likes an article. There were 5468 views from 4050 visitors, with most views from the United States (2172) and Canada (711). 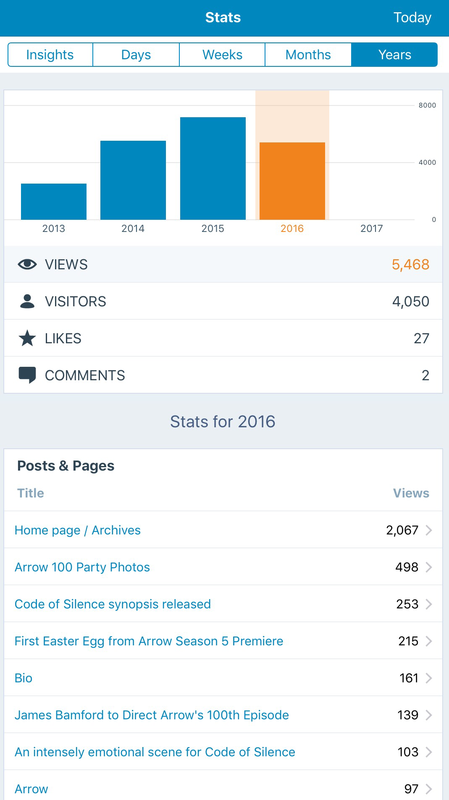 The most popular posts were the Arrow 100 Party Photos (498) and the Code of Silence synopsis (253).